In an impressive installation that is a display of ultimate fidelity and power, BSS Audio Soundweb™ London was utilized for the Praterdome, one of the largest and most modern nightclubs in Austria. The nightclub has two levels, four dance floors and 12 theme bars, with DJs playing music styles from various decades and styles including, house, techno, R&B, soul, 70s, 80s, and 90s. The system was installed by German based sound integrator FACE. The installation features signal processing and audio distribution by Soundweb London BLU-160 devices. 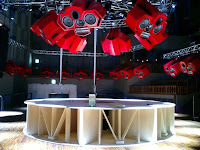 Opened in October 2008, Praterdome is owned by MPC (Music Park Concepts), which spent over seven million Euros in the development of the nightclub. “We needed a sound system that was going to effectively cover the entire venue. With people constantly moving all over the facility, the sound quality needed to be consistent,” stated Praterdome’s manager Thomas Zuchner. Soundweb London features a low latency, fault tolerant digital audio bus of 256 channels which uses standard Category 5e cabling giving a distance of 100m between compatible devices. The BSS Audio MC-1 fiber optic media converter can be used to increase the distance between devices to over 10km (6.2 miles) using single mode fiber. Additionally, JBL speakers were installed throughout the club. This includes 41 JBL SRX 728s, 18 JBL SRX 728s, and 16 JBL SRX 715s. Forty JBL Control 26Cs were incorporated as well. Additional Harman products in the installation include multiple Crown XTi 1000 amplifiers and CT3000 amplifiers. A total of 130 speakers and subwoofers create a sound system with a capacity of 100,000 watts. Expanding its audio and production capabilities with the installation of two Soundcraft Vi4 digital mixing consoles, the University of the Arts recently completed a major audio installation in the Caplan Center for the Performing Arts. Both the 215-seat Recital Hall and the Studio Theater are equipped with separate Vi4 consoles, allowing University Of The Arts Sound Engineer, Scott Rosenthal, to mix with ease and confidence. The University of the Arts was previously mixing on analog consoles and the migration to digital has seen an increase in both productivity and education value. Rosenthal’s decision to purchase the industry leading Vi4 for the Caplan Center has increased revenue for the University and has also given students added resources to enhance their post-graduate careers by recording ensembles and recitals for their portfolios. The Vi4 offers countless features including access of up to 72 inputs on 24 faders, with a total of 35 output busses available for use as masters, groups, auxes or matrices. The Vi4 also provides users with two of the most popular features from the Soundcraft Vi6, such as the highly acclaimed Vistonics™ II touch-screen user interface and Soundcraft FaderGlow™ fader function display. 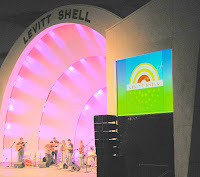 Demonstrating the ease of installation and sonic accuracy of JBL VERTEC® line arrays, Meeting Services Inc. of San Diego, CA recently installed a new audio system for the renovated Levitt Shell at Overton Park in Memphis, TN. Since its dedication in 1936, The Levitt Shell has entertained Memphians with a variety of performers, including Elvis Presley, Johnny Cash and the Grateful Dead. The Shell re-opened in the fall of 2008, once again offering free outdoor concerts, with upgraded audio, video and lighting systems. Meeting Services’ installation at the venue included 10 JBL VERTEC VT4887ADP powered, compact line array elements with JBL DrivePack® technology and four VT4881ADP powered, arrayable subwoofers. The line arrays are configured in a left-right, stage-stacked arrangement. Eight JBL VP7212M’s are used as stage monitors and two VP7210 loudspeakers are used as front fills. A dbx DriveRack 4800 is the master system controller, with Harman HiQnet™ System Architect™ software in use for remote control and monitoring. Three pairs of JBL Control 2P’s compact powered reference monitors are used backstage for dressing and green rooms. AKG microphones and dbx DB-10 direct boxes round out the system. Bringing SXGA+ resolution and advanced functionality to applications where high brightness and detail are important, Hitachi Home Electronics (America), Inc., Business Group today announced the introduction of the CP-SX635 3LCD projector. The CP-SX635 is designed for environments such as simulator projects, offering a brightness of 4,000 ANSI lumens and four optional lenses for various throw distances. The CP-SX635 offers a 2,000-hour hybrid filter, making maintenance and cleaning much less frequent. The lens shift option makes the CP-SX635 very easy to install. Additionally, 16 watts of audio provide ample sound for most applications, while the audio pass-through function allows users to put the projector in standby mode when only audio is needed. Additionally, the CP-SX635 model can also be remotely controlled and maintained through a LAN network connection, providing the ability to network, control and maintain the projectors remotely. The network functionality also makes it easy to control multiple projectors in different rooms and to monitor for functions such as remaining lamp life. The CP-SX635 projector also offers functions proprietary to Hitachi such as My Screen, My Memory and My Button as well as input source naming and blackboard/whiteboard/daytime modes. Security features include a PIN lock, Kensington slot and transition detector. Lastly, the CP-SX635 offers full connectivity including a HDMI input. “The introduction of the CP-SX635 3LCD projector demonstrates Hitachi’s continued commitment to reliability, versatility and unmatched performance,” said John Glad, product manager, Hitachi Home Electronics (America), Inc., Business Group. Math class has never been as exciting since Kamiakin High School in Kennewick, Washington upgraded classroom technology with Hitachi Software StarBoard interactive whiteboards. Purchased through Troxell Communications, the school utilizes the Hitachi FXDUO-77 model StarBoard. Jenny Byrd, a mathematics teacher at Kamiakin, is utilizing the StarBoard in all of her classes. “Typically I have notes including pictures, definitions, examples and practice problems that I display onto my board. The Hitachi interactive whiteboard improves what I have previously done in many ways. I love that when I move on to the next page, the board has saved my work on the prior page. This allows me to switch back and forth to the example problem if the students are struggling on a practice problem,” stated Ms. Byrd. 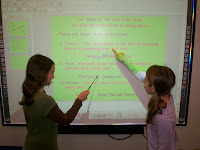 Additionally, the interactive whiteboards have become an asset in the rare circumstance that the teacher is absent. “When I have a substitute, I record my voice and interactions into the board for the sub to play. The students no longer fall behind if the sub is not familiar with the type of mathematics the students are learning. It also allows for a more productive class with the students because the sub doesn’t have to try as hard to keep them engaged in a worksheet. The students now have a video to watch and notes to take and I can still give students practice problems to solve,” stated Ms. Byrd. 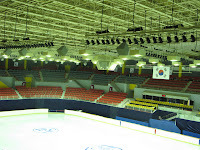 In another example of Harman Professional technologies being deployed at world leading sporting events, integrator Sovico, a Korean distributor, designed a Harman sound system at the 2008-2009 SBS ISU Senior and Junior Grand Prix of Figure Skating Finals held at Ice Arena in Goyang City, Republic of Korea, from December 11 to 14. Goyang Ice Arena opened with international and state-of-the-art facilities at the Goyang SPART Comlex & Park in October 2005. Sovico provided the design set-up for the rink’s Harman Professional audio system. A total of 84 skaters represented 12 International Skating Union (ISU) members during the course of the four-day event; all looking for the opportunity to win medals and prize money in either of the disciplines that are rewarded; men’s singles, ladies’ singles, pair skating, and ice dancing. The Senior Final presents 24 skaters/couples with the chance to display their best skills in order to prevail to the $272,000 prize money. Before the Final, six skaters/couples qualify in the six events of the ISU Grand Prix of Figure Skating Series: Skate America in Everett, Homesense Skate Canada in Ottawa, Samsung Anycall Cup of China in Beijing, Trophee Bompard in Paris, Cup of Russia in Moscow and NHK Trophy in Tokyo. Audiences at the Finals were satisfied with the sound system’s ability to stimulate exceptional audio quality. “The brilliant sound system was a big help in success of the event,” said a civil official of Goyang City. Harman proudly supplied the system with 26 Crown Macro-Tech series amplifiers, six Crown CE2000A amplifiers, eight Crown CE1000A amplifiers, 12 JBL LSR6235P studio monitors, 20 JBL Control 25AV loudspeakers, 43 JBL AM Series loudspeakers, six JBL AE Compact Series loudspeakers, six JBL SRX715 loudspeakers, 14 JBL Control 5 monitors, 12 JBL PD Series loudspeakers, two Soundcraft K3 consoles, Soundcraft K1 console, five AKG K271S headphones, 19 AKG microphones, and additional processing was provided by dbx and BSS audio products. Sovico did not hesitate in distributing Harman audio products for this complex task. Goyang City holds presence to an international standard sized swimming pool building next door to the rink and was concurrent with the decision to also install a large sound system primarily made up of Harman Pro products. The Pop Academie National College for Popular Music located in Mannheim serves a very active music scene with artists such as Xavier Naidoo, die Söhne Mannheims, Laith Al-Deen, Groove Guerrilla, Mardi Gras.BB and Joy Fleming. Founded in 2003 by the Baden-Württemberg county as a public-private partnership, the Pop Academie is funded through national and private contributions. When upgrading the recording studio earlier this year, studio manager Marcus Thiel chose a 32-fader Vista 5, not only for Studer’s renowned audio quality and reputation, but primarily for the intuitive operation of the console, a highly important feature when teaching students the art of recording. Studer’s patented Vistonics™ GUI is widely regarded as the best user interfaces to be found on digital consoles. The Vista 5 is configured with 24 Mic/Line inputs, and 2 MADI outputs linked to a ProTools audio workstation and an RME Madi link to a Logic/Cubase workstation, and is used as part of the studies to record Pop and Rock bands. 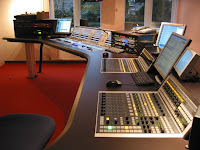 Soundcraft Studer reports that sales of its analog Broadcast mixing consoles remain particularly strong, despite the economic conditions and even the transition to digital. Sales of the long-established RM100, RM105, Series 10, Series 15 on-air desks and the production-orientated B400, B800 and BB100 desks are as strong as ever, proving that the market puts a lot of faith in choosing the right, reliable and proven products for use in its facilities. Recent sales in the Broadcast sector have been made to City College Coventry, where 5 of the Series 10 desks have been installed in the technology suites for Media courses, and to Satellite Information Services Live who purchased 3 of the BB100 production mixers, with other analogue consoles sales to RAI and Radio Italia in Italy, TRT in Turkey and ERT in Egypt. The company has also recently announced that many models will now be readily available from stock in standard configurations, which helps reduce delivery times for time-critical installations. “We found that people are less willing to wait for custom-configured desks nowadays, (which we still do to order) but that most configurations used pretty-well identical modules. So we chose to stock what we consider to be the most popular configurations so that delivery times are minimized,” reports VP of Sales, Adrian Curtis. The standard configurations typically include a mix of Mono, Stereo and Telco input modules, master module, VU meters and a timer. The Vi Series also has optional interface cards which make it particularly useful in HD trucks, such as an SDI de-embedder/embedder card, and a Dolby D/E decoder card, which help to save cost, space and weight. Other broadcast-specific functions include a high bus count for cleanfeed outputs, and configurable GPIO connections for fader starts, signalling etc. Crown Audio today announced the appointment of Guillermo Sanchez to the position of Business Developer for Central and South America. In this role Sanchez will be responsible for supporting the sales within the region and working closely with the customer base to ensure all products are tailored to meet their needs. He will report to Director of Marketing for Installed Sound, Brian Divine. Previously, Sanchez served as Chief Sound Designer and Engineer for Corporacion Dynaco. In this role Sanchez was responsible for preparing and engineering sound reinforcement equipment for live music, corporate events, television. He also engineered sound solutions for events such as parades and political events in this role. Sanchez is also the former owner and Chief Sound Designer and Engineer for Dynacoustic. In this position he specialized in the design and engineering of sound equipment for major live sound events. “Guillermo has over twenty-five years of experience as a sound engineer. As a veteran of the industry he’s well aware of the needs and challenges of our clients and his background will prove to be a major asset for them to tap into,” stated Divine. Harman International Industries (NYSE: HAR), a leading provider of branded audio and infotainment electronics for the home, the car, and sound professionals, today announced that components from its JBL Professional and Crown Audio divisions were deployed by sound company Maryland Sound (MSI) for the highly anticipated United States Presidential Inauguration Ceremony that took place in Washington D.C. yesterday. The event drew the largest civic-event audience ever served by an outdoor sound reinforcement system in the United States, with a crowd of as many as two million people jamming the National Mall and surrounding areas. The sound reinforcement system featured JBL Professional VERTEC® line array loudspeakers powered by Crown Audio I-Tech amplifiers and managed using Harman HiQnet™ System Architect™ software. The company’s VP7315DP, VRX932 and Control 25AV speakers projected the swearing-in ceremony, the new president’s speech and performances by a host of leading artists. The sound system was designed by Pat Baltzell of Baltzell Audio Design and was supplied by Maryland Sound (MSI), led by Bob Goldstein, President. “JBL VERTEC simply has more total power output than the competitors. Additionally, this is the first inauguration we’ve been able to utilize Crown I-Tech amplifiers, and therefore run System Architect. Utilizing a Harman system has certainly provided us with the increased flexibility we’ve needed for this unprecedented event,” stated Baltzell. “We are extremely pleased with the assortment of tools that Harman provides us. From the superb JBL VERTEC line arrays to Crown amplifiers and Studer and Soundcraft consoles and other products. We are able to achieve the highest fidelity sound possible and vastly superior to that which was available only a few years ago. Given the harsh environmental conditions we were working in, which has brought sub zero temperatures and lots of precipitation, the equipment worked flawlessly with no failures,” stated Bob Goldstein, President of MSI. Following the Swearing in Ceremonies, Maryland Sound (MSI) also provided Vertec Line Arrays for the Inaugural Parade route from the Capitol to the White House. On several nights leading up to the Inauguration MSI provided a host of JBL and Crown systems for myriad events including the Finance Dinner. In addition to the inauguration, Harman Professional audio components were central at the numerous celebration concerts that took place around Washington D.C. the week preceding the swearing-in ceremony and the night of. On the eve of the inauguration, MSI provided JBL loudspeakers, Crown amplifiers, Soundcraft Vi4 and Vi6 and Studer Vista5SR consoles for several Inaugural Balls including the “Commander in Chief Ball” at the National Building Museum and the Biden Home States Ball at the Washington Convention Center. MSI provided JBL VERTEC systems for various other concerts around Washington featuring Carol King, Faith Hill, Bon Jovi, Stevie Wonder, Josh Groban, Ludacris and Beyonce. Firehouse Productions supplied sound for a concert to honor military families, featuring Miley Cyrus and the Jonas Brothers at the Verizon Center. This was followed by a concert on the evening of January 20 in which audio system provider ATK/Audiotek utilized JBL VERTEC line arrays to provide sound for an all-star line-up charity concert featuring Sting and Elvis Costello at Washington's Harman Center of the Arts. In an effort to provide its students with the optimal 21st century classroom experience, Western Springs School District 101 in Western Springs, Illinois has chosen Hitachi Software StarBoard interactive whiteboards. Purchased through Troxell Communications, the school utilizes the FXDUO-77 model StarBoard along with the award-winning Hitachi CP-A100 3LCD projector as part of the Hitachi CP-A100+FXDUO bundle. The StarBoards have been particularly popular at the elementary level where teachers are utilizing them in all major subject areas. “In English we are using it to pick out verbs, in math students use the board to solve math problems, and in social studies it aids us when we are studying a map of a specific area of the world,” stated Scott Elder, 5th grade teacher in the Western Springs School District 101. Mr. Elder is in his first year in utilizing the Hitachi StarBoards but he feels it is a valuable tool that enhances his teaching. “I use it everyday and the students love it. This technology engages student’s and more attentive in class—far more than when using the textbook. It’s such an interactive tool you see the difference in the learning experience by using it,” added Mr. Elder. District technology coordinator Damon O’Hare explained that the district considered purchasing interactive whiteboards from other companies but Hitachi offered distinct advantages. “When you compare the Hitachi interactive whiteboards to others on the market, the technology is far superior. We needed to invest in a product that we knew would be best for our long term investment both financially and for our students. With the extremely competitive price, we realized we were getting the most for our money with Hitachi,” stated Mr. O’Hare. Western Springs has planned to purchase additional Hitachi CP-A100+FXDUO bundles over the next two years. “Currently, we have 20 of the bundles and we distributed five to each school in the district. The ultimate goal is to have one in every classroom in our district and we will continue to work toward that,” added Mr. O’Hare. In a move to address the needs of both its contractor and end user communities in all vertical markets, Crown Audio today introduced its 660A commercial sound amplifier with a re-engineered high bandwidth filter that provides comprehensive system reliability in the most demanding fixed installation environments. The 660A represents a renewed commitment to providing the highest quality amplifiers for commercial and industrial audio. The 660A has six inputs and six 60W power amplifier channels for multi-zone systems. It can drive different types of speakers in different areas of a facility. The amplifier is ideal for applications in schools, hospitals, factories, restaurant/retail, house of worship, fitness facilities, and 5.1 surround systems. These low-cost units provide all necessary features in a simple building-block format. The sound system can be upgraded as a facility expands, allowing for the addition of more mixers for more inputs, or add more power amps to handle more zones. The amplifier features balanced Phoenix-type line inputs and touch-proofed screw-terminal speaker outputs. Its advanced protection system includes output current limiting, DC protection, circuit breaker/fuse, and thermal protection. The 660A is backed by Crown’s 3-year full warranty. Conveying nothing short of a bona fide rhythmic and groovy bassist sound, Bootsy Collins is recognized as one of the most distinguished bassists in the development of funk music. Today he continues his more than thirty years of success in the music industry by using Eventide’s TimeFactor effects pedal. Known primarily for his role in Parliament/Funkadelic and as the lead singer/bassist of Bootsy’s Rubber Band in the late 70’s, Collins has recently turned to producing movie, video game, and animation scores. Bootsy’s Rubber Band collaborated around a musical sensibility that was at the forefront of a new genre of music in the late 70’s. Collins often drove the group’s songs with his eclectic sound and has recently transferred that sound into today’s music realm with the use of the TimeFactor pedal. The Eventide TimeFactor crams nearly 40 years of Eventide studio quality effects technology into the trimmed down form of a stompbox. Eventide has taken its 10 best delay effects and integrated them into a compact stompbox that produces guitar effects equally well in the studio and holds up as a robust road tool that fits into a pedal board. TimeFactor includes 9 stereo or dual mono delay effects, including Digital Delay, vintage DDL, Tape Echo, Modulated Delay and Ducked Delay, as well as Band Delay, Filter Pong, MultiTap Delay, Reverse Delay, plus a 16 second vari-speed Looper. TimeFactor offers real time control of all the parameters via 10 knobs, expression pedal, or a MIDI footcontroller. TimeFactor has 40 presets and features tap tempo, MIDI clock sync, line and instrument inputs and outputs, USB for software upgrades, and true analog bypass. It is housed in a rugged cast metal construction featuring reliable metal footswitches for direct preset access. Currently, working with the TimeFactor, Collins is developing sounds that distinguish him from others in the business of production. Emerging band Alberta Cross is currently touring the U.K. with Oasis and lead guitarist, Sam Kearney, has selected Eventide’s TimeFactor for its wide range of effects and delay capabilities. In addition to the current tour, Kearney also applied the TimeFactor to the band’s debut full-length album for release in April 2009, on Ark Recordings. The band’s previously released hits are critically acclaimed and include “Low Man” that was featured as the closing song to an episode of Showtime’s ‘Californication’. TimeFactor features 10 stereo or mono delay effects and gives musicians, as well as engineers, the power to adapt to any music style. The provided effects include: digital delay, vintage delay, tape echo, mod delay, ducked delay, band delay, filter pong, multi-tap, reverse, and looper. 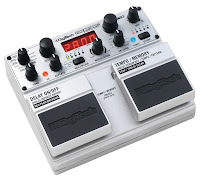 TimeFactor offers real-time control with the expression pedal and instant Preset access. 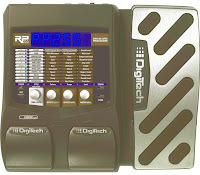 The plug-and-play expression pedal control works with wet/dry mixes or any combination of parameters. January 16, 2009 – Today at NAMM, Eventide announced the launch of a factory mail-in rebate program for its best-selling line of stompboxes including TimeFactor, ModFactor and the recently announced PitchFactor Harmonizer® stompbox. Effective immediately and lasting through April 23, 2009, customers are eligible for a $25 rebate on the purchase of any single Eventide stompbox, a $60 rebate with the purchase of any two Eventide stompboxes and a $95 rebate with the purchase of PitchFactor in combination with two other Eventide stompboxes. Visit eventide.com for the rebate form and rules. Showcasing its versatility in virtually every application, ranging from live sound and recording to houses of worship applications, the Soundcraft MFX12™ multi-purpose mixer offers the finest quality effects in its price range. Paul Chambers, composer of over 300 records, demonstrates the professional quality of the MFX12 mixer as he records and remixes for countless artists and most recently completed a 10-part series for Channel Five television. The MFX12 mixer combines all the features of the popular Soundcraft MPM™ mixer with a built-in 24-bit, digital, Lexicon® effects processor, expanding the Soundcraft low-cost, multi-purpose compact range. The effects section fits neatly into the mixers compact framework, which is available in eight, 12 or 20 mono input variants, both with two stereo channels and effects send on each channel. There are 32 different effects to choose from with a tap tempo function, three effects parameter controls and a user effects setting store facility. An effects channel level clip LED and Mute function gives the user even more flexibility. Highlighting the global acceptance and demand for loudspeakers from JBL Professional, rental companies servicing numerous major tours and events around the world relied upon VERTEC® line array systems in 2008. Whether it was AVPG in Texas meeting the demanding special-benefit concert sound needs of award-winning country songstress LeAnn Rimes with their new compact powered VT4887ADP/VT4881ADP rig, Sound Media Fusion deploying mid-size VT4888DP-AN powered line arrays for the 2008 Summer Olympics in China in the Beijing National (“Bird’s Nest”) Stadium, Sound.com of India adding new VT4888 line array elements to its VERTEC inventory to service a “Bollywood” extravaganza at the world’s largest film studio complex in Hyderabad, AdLib Audio fielding VT4880A Ultra Long Excursion arrayable subwoofers for the U.K. tour by German rock legends The Scorpions, or Maryland Sound handling New York’s Times Square New Year’s Eve for a broadcast audience of one billion persons with VT4889 full-size line array elements, rental sound service providers around the globe offered their clients the precision coverage, premium fidelity, and robust output power capabilities of JBL’s industry-leading line array systems. A unique case in point was the recent “Heaven's Rehearsal,” a large-scale multi-denominational musical event on November 1, 2008 intended to reflect the gathering of all nations, tribes, peoples and languages in Toronto, considered by many to be the most ethnically-diverse urban center in the world. The event was staged in Canada’s massive indoor/outdoor Rogers Centre, formerly known as the Skydome, and equipped with the world’s first fully retractable roof. The 55,000-seat venue is home to Major League Baseball’s Toronto Blue Jays and the Canadian Football League’s Toronto Argonauts, and frequently hosts concerts from some of the world’s top performers, soccer matches, motor sports, family shows, conventions, trade shows and private events like this one. “Heaven’s Rehearsal” featured a contemporary band on stage to support solo artists like Dominiq, Maggie Blanchard, and Raymond Anthony Fuentes plus a full orchestra and 500-member choir. The major special event was supported by Toronto’s PA Plus Productions, Inc. 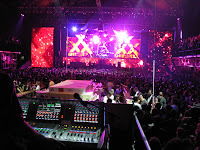 The PA Plus event team onsite, led by Senior Engineer John Lacina, deployed a total of 60 VT4889 full-size line array elements, 32 VT4880 full-size arrayable subwoofers integrated into the full-range speaker arrays, and four VT4887 compact line array elements under-hung for center down-fill. Four main arrays were flown 22.5 degrees apart on a 160-foot (49-meter) radius. In total, 636 driver elements were energized with total available power of 320,000 watts provided by 80 Crown I-Tech power amplifiers. Using Harman’s HiQnet™ System Architect™ software for remote control and monitoring allowed sections of the arrays to be turned off as required, to limit the coverage down to 30,000 people, the minimum attendance expected. The general seating was assigned in a pre-determined order, enabling the audio team to turn on sections of coverage as more distant seating zones were filled. “JBL’s VERTEC line array systems gave us the predictability and sound-pressure level required to focus acoustic energy only where it would be needed,” summarized Radu. “The system design worked as planned and we were able to minimize spill outside the desired coverage zones. Overall, considering all of the challenges involved, everyone was pleasantly surprised with the final result." Demonstrating how creatively-designed sound systems featuring highly-configurable, great sounding components can make a club’s reputation and also enable business models that optimize the venue’s real-estate investment, NYC IT-Club, Santos Party House, features advanced sound systems designed and integrated by TimbreTech Audio Services that support DJ/club and live performance and multiple events and ‘showtimes’ in one evening. Club sound icon, Jim Toth, designed a live system around a Soundcraft Vi6 console at Front Of House that is easily locked off and run remotely via a laptop in the DJ Booth when one of a host of top DJs is performing in the house. Toth credits the Vi6 with the versatility to transform the club from a top-notch live sound venue into a premium club with unprecedented ease — and with the console’s category-leading Vistonics user-interface, Toth explains that visiting engineers typically require just five minutes to become comfortable and proficient with the board. Underscoring this confidence, Toth placed a Soundcraft Vi4 at the monitor position running 6 JBL SRX 712M 12” monitor wedges powered by Crown XTI 6000 Series amplifiers. The live system features JBL VerTec VT4887DP Series line array elements, with JBL VerTec VT4880 subwoofers. Featuring integrated power and DSP, Toth’s use of the VerTec VT4887DP loudspeakers allowed him to set the level and EQ of each cabinet individually — a key advantage in configuring the array for the room requirements and also a welcome advantage among visiting engineers. The dance system is where Toth — a self-admitted compulsive audiophile — has his most fun and extracts his greatest satisfaction! He returned to his roots as the system designer of Eighties club-land icons like Peppermint Lounge and Mars and built a 24-foot horizontal array of custom designed 5-speakers that spans the length of the room and delivers an amazingly even coverage. Each 5-way featuring 24” and 15” drivers in a line spaced with minimal interference or cone filtering because they’re spaced apart very carefully. Bass is supplied by the same JBL VerTec VT4888 subwoofers. Santos Party House has a smaller, second room downstairs for which Toth designed a system comprising custom cabinets and VT4880 subwoofers with two monitor arrays hanging conventionally with eight cabinets on each side of the DJ booth. Toth observes with no small amount of satisfaction how some visiting DJs matrix between the monitor and dance systems, and mix straight from the line arrays. Guitarist C.J. Pierce of the Dallas-based metal band Drowning Pool is currently on tour to support the band’s current release “Full Circle” on Eleven Seven Music. C.J. has been utilizing the new DigiTech® HardWire™ HT-2 chromatic tuner to keep himself in tune throughout the tour. C.J. has been using DigiTech® effects for many years including the GSP2112 preamp processor and the Whammy4™ for all his tones and pitch shifting effects. Drowning Pool is a four-piece rock band that was formed in 1996. They rose to fame while playing along with Ozzy Osbourne during an Ozzfest tour in 2001. Their most recent album has a post-grunge sound and is less heavy than their previous work. The first single off the album, "Soldiers," is dedicated to all the men and women of the United States Army. The DigiTech Hardwire Series HT-2 is a chromatic tuner pedal that is visible, accurate and durable when in use, transparent when not. The cornerstone of every pedalboard is a reliable tuner. The HardWire Chromatic Tuner's true bypass means that when it is off, it's out of the circuit. Reprising the broad market success of its XTI Series of portable sound amplifiers for live sound and fixed applications. Crown Audio is introducing the next generation XTI6000 that features advanced power performance, improved system reliability, and a new breakthrough user interface for configuration and control in Crown’s HiQnet™ Band Manager™. The Crown XTI Series has earned a formidable reputation in the portable sound market place, leveraging Crown’s unparalleled heritage in live sound amplification. The new XTI6000 provides audio professionals with the winning addition of a power amplifier solution to this high value, high performance product line. “The best just got better with the XTI6000. We’ve listened carefully to the needs and suggestions of end users and retail partners before we built a compelling new amplifier that packs tremendous punch, performs consistently, and is priced to reach the broadest possible market,” stated Andy Flint, Crown marketing manager for portable PA. The XTI6000 allows for plug and play usability with it’s integrated proprietary DSP with LCD front panel making it easy to set crossovers, delay, limiters, and EQ along with the ability to save and recall up to 20 presets. Continuing the heritage of previous XTI-Series amplifiers the XTI6000 features an LCD screen with speaker presets for crossover frequencies, EQ, limiting, delay, and a subharmonic synthesizer. Additionally, there is switch-mode universal power supply, useful function indicators, propositional-speed fan-assisted cooling, XLR inputs, Speakon® and binding-post outputs, and short-circuit protection. The XTI6000 weighs in at 24lbs and has a MAP price of $1,999. Delivering an unprecedented sound management solution to the portable PA market, Crown Audio has introduced HiQnet™ Band Manager™ software. The free-of-charge application provides a sleek function-driven interface designed to simplify system setup and management while enabling audio professionals, musicians, and engineers to configure and control a rack of Crown XTi series amplifiers. Band Manager unlocks all loudspeaker processing capabilities of the XTi Series. Once it automatically discovers up to eight USB-connected XTi amplifiers, represented in a virtual rack, all the setup required is to load each amplifier with the JBL-provided speaker tunings and set which amplifiers are driving front-of-house. Band Manager makes smart use of browser-style navigation and the ‘Home’ screen displays monitor strips for each amplifier in the rack and front-of-house EQ and level control. EQ for stage monitors and all other processing is accessible on an individual amplifier basis. 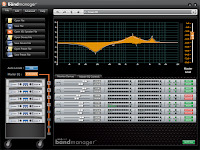 Upon starting Band Manager, all amplifier settings are transferred from the connected devices but they can also be saved to disk for quick recall if the rack is used often in multiple venues. Band Manager is a cut-down version of its parent software, HiQnet System Architect™, a much larger application which provides full-system control of over 70 professional audio devices from across the entire Harman Pro group, including the XTi Series. Anyone who has already used System Architect with the XTi will instantly be familiar with the amplifier control layout since Band Manager makes use of the same software plug in. Directly tailoring Band Manager to the needs of portable PA market enables far quicker configuration of a rack of XTi amplifiers by bringing only the essential tools into direct focus. For those who need the more advanced control, any rack configurations saved within Band Manager can be opened in System Architect. By using the plug in concept, Band Manager is all ready to control other future portable PA HiQnet devices. While Band Manager is being introduced to operate in conjunction with Crown XTi amplifiers it is planned to take control of other complimentary Harman HiQnet products in the near future. “As a group, we envision Band Manager being used to manage an entire portable PA sound system all the way from microphone to speaker. When introducing software control, making the management of a potentially complex audio system as simple as possible is the most important goal. It is no longer enough to just provide the user with the highest quality equipment, you need to offer great, user-friendly tools to open its potential as well,” added Flint. Demonstrating the performance and versatility of AKG microphones, the technical staff for rock icon Neil Diamond selected AKG microphones for his 2008/2009 world tour, celebrating the first chart-topping album of Diamond’s storied career. Neil Diamond is one of the most successful adult contemporary artists in history and has sold well over 120 million records worldwide. Diamond’s successful career has spanned over 40 years and his current tour illustrates why he is one of pop music’s most enduring and successful performers of all time. The C 414 delivers excellent sonic performance in a wide range of recording and live sound applications including pianos, percussion, acoustic guitars and orchestral recording. Its 1" gold sputtered, edge-terminated dual diaphragm capsules have a very smooth and warm response and users have the ability to select from five different polar patterns including cardioid, hypercardioid, and wide cardioid omni-directional or figure-8 by using the easy-to-use pattern selector switch. The C 414’s features include three switchable attenuation filters and three bass-cut filters that minimize undesirable low frequencies caused by wind vibration or proximity effect. Minimizing low frequency noise benefits artists such as Neil Diamond, who perform in a number of outdoor venues. The C 414 has been upgraded and improved several times over the past 37 years as technology has improved in response to the requirements of ever-demanding artists and engineers. Demonstrating the versatility and performance of AKG wireless technologies, the WMS 4000 wireless system and the IVM 4 in ear monitoring system were recently deployed on Kanye West’s most recent world tour that visited 40 cities and six continents. The critically acclaimed “Glow In The Dark” tour featured performances by renowned artists Lupe Fiasco, Rihanna, N.E.R.D, and Nas. The yearlong tour began in Seattle and continued throughout Latin America, Asia, Europe, New Zealand and Australia. The WMS 4000 wireless system offers users with countless features including an advanced backlit display on the transmitters and the receiver, remaining battery life readout, silent mode, pilot tone status data transmission, environment scan and rehearsal functions, and auto setup frequency search. The WMS 4000 can be integrated into a Harman HiQnet™ system with the optional HUB 4000 Q. With the PC control software System Architect™ the WMS 4000 can be remotely controlled and monitored from a PC. The setup and configuration of the frequency management of the entire wireless system is incredibly easy within System Architect with tools like RF Monitor, Device Manager, Environment Scan and Auto Setup. The IVM 4 system enables technicians to connect 16 IEMs to one antenna creating a clean tech area that is conducive for a high profile show like the Glow In The Dark Tour. Clean frequencies can be searched within the system for the 16 IEMs and 4 HUB wireless 4000 Q units with the HiQnet feature as well. Based on its ability deliver a warm, transparent, and natural sound similar to that of an analog desk, Sweetwater Audio used the Studer Vista 8 console for the live broadcast of the 60th Annual EMMY® Awards telecast on Sunday, September 21 at the NOKIA Live Theater in Los Angeles, CA. Additionally, ATK/Audiotek deployed JBL VERTEC line arrays for the sound reinforcement system in the arena. Currently riding high with tours and engineers thanks to the incredible success of the Vi Series digital consoles, Soundcraft is turning heads in many industries with the Si3 digital console. This new desk is designed for live use on both touring sound systems and in fixed installations and its intuitive operation and high input and bus count makes it a perfect choice for house of worship sound systems. Theatre applications have also found the versatility and excellent sonic quality has been a tremendous upgrade to their sound system. A distinct advantage of the Si3 is the single chassis construction which includes all input and output connections and the power supply – so it can literally drop in and replace an existing analog desk as almost certainly no additional cabling would be required to install it. This compact footprint desk can directly handle 64 mono inputs, four stereo inputs and has full connectivity for all 35 output busses (24 Aux/Group, eight Matrix and Left/Right/Centre mix buses), something you don’t find often on digital consoles at the price level of the Si3. Add to this four Lexicon® effects processors, 12 VCA groups, eight Mute groups and bar graph metering for all 35 bus outputs and you begin to see what a package the Si3 is. So what about the operating surface, is it easy to use? The obvious lack of what is now standard fare on most digital consoles, a large central screen, brings hope that cumbersome centralized channel operation is a thing of the past, and indeed when you look at the controls in detail you see it may well be. Although the Si3 does have a small central touch screen, it is really there for console management, cue-lists, labelling etc. All the normal day-to-day mixing operations are carried out adjacent to the channel faders continuing Soundcraft and Studer’s philosophy of ‘where you look is where you control.’ An amazingly crisp and bright OLED display clearly shows important channel data for every fader on the desk, while in the centre section, OLEDs provide the same for the output faders. Soundcraft has revisited the control topology employed on the ground-breaking Spirit 328 and 324 digital consoles, and made it even easier. The model is this - above each fader is a rotary encoder, the function of which changes according to the mode selected. This ‘bank’ of encoders, known as the VCS or Virtual Channel Strip can be set to control every function of a channel (known as Channel mode), so mic gain, EQ, dynamics, auxes, panning are all controlled as if you had a normal analogue channel strip laid sideways in front of you. The VCS also incorporates all the switching you would find on an individual analogue channel strip (48v, Phase Reverse, EQ in etc.). Alternatively, in what is called Global mode, each encoder controls the same function for each channel. So, for example, the encoders could control all the mic gains, pans or a chosen Aux bus (very useful for creating monitor mixes). The encoder and OLED displays located in the output section are used primarily for output signal controls such as EQ, dynamics, Matrix contributions etc. but also double up as dedicated controls for the four onboard Lexicon processors. When using the Lexicon processors, you can expand the controls to adjust virtually every parameter available, giving you outstanding control over the effects. Each of the four Lexicon engines can be assigned by the user to any channel. The gates and compressors, as you would expect, draw on the heritage of BSS Audio and dbx, Soundcraft’s sister companies within Harman. Like its bigger sisters the Soundcraft Vi4 and Vi6, the Si3 uses the patented Soundcraft FaderGlow™ system to show what mode your faders are in, whether they are controlling inputs, aux or effects sends, bus outputs etc. For example, when faders are controlling Aux sends, the faders glow yellow, while for VCA’s they glow blue. In fact the colour codings closely follow the Soundcraft Vi6 setup, so engineers moving between consoles will be equally at home with both. Complete desk settings may be stored as snapshots, as you would expect on a digital console, and these can then be sequenced from a Cue list on the central touch screen and controlled with dedicated snapshot automation buttons. Global snapshot filtering is also available. Under the hood of the Si3 is an array of new technology, most notably EMMA, a single-board digital mixing console with an embedded operating system. This compact pcb holds not only the processing and DSP to run the mixer with its EQ and dynamics, but also four Lexicon AudioDNA chips to provide the Si3 with arguably the best effects available in the pro audio world. The team of developers at Soundcraft was responsible for the entire development and coding of this new mixing core which is also the base core of further new console designs already in development. But how does it sound? Needless to say with the wealth of experience in digital platform development that Studer and Soundcraft have with the Vista and Soundcraft Vi Series, the Si3 has inherited the same sound quality pedigree, and coupled with company founder Graham Blyth’s talents in mic pre-amp design and the extensive development of the integral dynamics and gates and Lexicon FX, sound quality is a given. On the rear of this highly-featured console are all the I/O connectors you’ll ever need. Sixty-four XLR’s for the mic/line inputs, four stereo line level inputs, 24 bus output XLR’s, eight matrix output XLR’s Left/Right/Centre mix output XLR’s, Left/Right/Centre monitor output XLR’s and comprehensive internal and external talkback and Oscillator connections. There are also eight analogue insert connections, which allow outboard processing to be inserted into any input channel output bus. Of course, the Si3 has been developed with Harman’s HiQnet™ networked audio system in mind, and connection to the HiQnet network is included. At Winter NAMM 2009, JBL Professional is introducing the new LSR2300 Series Studio Monitor System, delivering professional performance at price points within reach of any studio. The LSR2300 Series addresses the demand for cost-effective, high-performance monitoring systems, driven by the proliferation of affordable, computer-based production systems. The LSR2300 Series includes: the LSR2328P Bi-Amplified 8-inch Studio Monitor with 160 Watts of amplification; the LSR2325P Bi-Amplified 5-inch Studio Monitor with 85 Watts of amplification; and the LSR2310SP Powered 10-inch Studio Subwoofer with an integrated 180 Watt power amplifier. In developing the LSR2300 Series, JBL applied the same stringent Linear Spatial Reference criteria used in the design of the acclaimed LSR6300 and LSR4300 Series. While most manufacturers take only a single on-axis measurement of the speaker’s performance, JBL’s Linear Spatial Reference criteria requires 70 measurements, yielding more than 1,200 times more data. The data enables JBL to engineer a system that produces greater accuracy at the mix position. A trademark of LSR2300 design is the large waveguide and the elliptical tweeter aperture that work in conjunction with a 1” silk-substrate high-frequency transducer to deliver superior imaging and smoother frequency response. Today’s music styles, film production and the demand for high-quality audio for HDTV require a monitor system capable of extended low frequency performance and high dynamic range. To address this, JBL engineered new long-excursion low-frequency transducers with high-flux motors and a custom tuned port that work in concert to produce deep accurate low frequency response, previously unavailable at this price point. The LSR2328P 8” model provides low frequency extension to 37Hz; the LSR2325P 5” model to 43Hz, and the LSR2310SP subwoofer provides deep low frequency performance below 29Hz. Additionally, each model in the LSR2300 line produces exceptional sound pressure level (SPL) achieved through the use of high-sensitivity transducers and careful attention paid to the thermal properties of the system. Since heat is the enemy of output, the low frequency port doubles as a means of cooling the amplifier output devices. The LSR2328P bi-amplified 8-inch 2-way monitor for example, includes 160 Watts of amplification and is capable of a maximum peak SPL of 117 dB. All three LSR2300 models survived the torturous JBL power test in which the system is required to play at full rated output for 100 hours before becoming a production-ready design. Featured to integrate into professional systems, all models include balanced XLR, ¼-inch, and unbalanced RCA inputs that allow connection to a wide range of playback sources including computer audio workstations, professional mixing consoles, as well as consumer playback systems. The LSR2310SP Subwoofer includes a 2-channel bass management system with selectable crossover settings and balanced outputs for integration of the sub into any system. LSR2325P and LSR2328P enclosures include mounting points and are reinforced for safe wall mounting. Transducers in all models are self-shielded to allow use in close proximity to magnetically-sensitive equipment. At Winter NAMM 2009, JBL is showcasing the next generation of EON® portable loudspeakers. This includes five models spanning the new EON500 and EON300 series, all of which feature the trademark portability, versatility and reliability that made the original EON series the most groundbreaking and revolutionary product of its kind. The new EON loudspeaker models feature deep-welled, full-size handles with ergonomically designed grip points. Combined with light weight and balanced weight distribution, the portability of speakers this size is unmatched. The new EON loudspeakers are also extremely versatile, offering flexible mounting capability, making the EON500 and EON300 series ideal for performing musicians, touring bands and mobile DJ’s. Lastly, the new EON loudspeakers offer a level of reliability that only JBL can provide, incorporating JBL’s legendary transducers and special limiter circuitry. 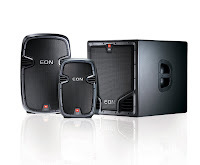 The EON500 series features three new models: the EON515 and EON510 2-way powered speakers, and the EON518S subwoofer. Each of the full-range EON500 series compact, lightweight models features an on-board mini-mixer with loop-thru or mix-out capability, allowing for greater control of the loudspeaker’s output. The EON500 series loudspeakers also offer selectable EQ, multiple suspension points, soft-grip handle and a full screened backed grille for extra component protection. The EON500 series loudspeakers feature a combination of JBL’s patented engineered components, enabling a smaller enclosure and lighter weight than competitive models. The EON518S is the first true subwoofer in the EON family of products. It’s comprised of a single 18-inch Differential Drive woofer in a vented enclosure and powered by a 500/1000 watts (continuous/burst) amplifier. The EON518S features a pole mount cup for sub/satellite applications, level control, dual inputs, a stereo crossover network, peak limiter and polarity reverse switch. It also has a speaker level input increasing connectivity, flexibility and system configuration options. The new EON300 series loudspeakers are the result of cutting-edge mechanical design and expertise in materials, making them as compact as possible but at significantly lighter weight than competitive models. Each of the EON300 series 2-way loudspeakers offers a high performance-to-price ratio, with a very simple user interface, along with multiple handles and suspension utility. The EON315 15-inch 2-way loudspeaker system offers a total of 280/560 watts (continuous/burst) power and weighs a slight 35 pounds (15.9 kilograms). The EON315 features a 15-inch JBL woofer and a 1-inch exit compression driver with a neodymium motor on a 100 x 60-degree wave guide. The input is mic-line switchable and offers connectivity flexibility in the form of a balanced XLR/quarter-inch combo connector. The EON315 also features one XLR output to facilitate signal loop through. The EON305 is a 15-inch passive 2-way loudspeaker featuring 250/500/1000 watts (continuous/program/peak) power handling. It offers a 15-inch JBL woofer and a 1-inch exit compression driver with a neodymium motor on a 100 x 60 wave guide. The inputs include two Speakon®/quarter-inch combo jacks linked in parallel. The EON305 is the perfect powered-mixer match, delivering all the fundamental EON attributes to a pre-existing system. Further advancing Harman HiQnet™ audio network configuration and control protocol, Harman Professional today launched HiQnet System Architect™ Version 1.9, a free download which delivers a host of new features including network troubleshooting tools, file compression and management and advanced control panel customization, to name just three. According to Rick Kreifeldt, Vice President, Harman Professional Systems Development & Integration Group (SDIG), today’s introduction comes just as the community of registered HiQnet System Architect users exceeds 20,000. As new members join the community of registered HiQnet users, Harman continues to add new devices to the HiQnet portfolio. Control of the three models of the new Crown I-Tech HD Series will be possible with the device plug-ins included with System Architect 1.9, which support the configuration of the FIR filters and LevelMAX™ limiters included in the new flagship touring amplifier, the algorithms for both of which were co-developed with BSS Audio. Currently, there are a total of 93 shipping HiQnet devices and a total of 66 System Architect-controlled devices. Worldwide frequency restrictions and digital TV present a huge challenge for wireless systems operators, and to assist with keeping wireless technologies running, AKG has added the new ‘1 Click Setup’ to its System Architect HUB 4000 Q plug-in. With a single mouse click, the tool runs an extensive environment scan and calculates intermodulation-free frequencies for the entire wireless system on the fly. High among the new additions is a Network Troubleshooting tool, which actively monitors the network, diagnoses and alerts of any problems and, where possible, automatically resolves the problem or, if manual intervention is required, provides specific instructions on how to address the problem. In addition to providing real-time monitoring and alerts, the tool also creates a backup log of any IP address changes which were made in the event that the previous configuration is required to be restored. One welcome use case will be for those less experienced with network configuration who have the frustrating situation of a HiQnet device being connected to the PC but not showing up in System Architect due to a network configuration error. The Network Troubleshooting tool will see the device, and work with the user to resolve the issue in a few simple steps. Also new to Version 1.9 is a compressed file format which dramatically reduces file sizes - in test cases as high as a ratio of 100:1. Separately, a new utility installed with System Architect 1.9 enables advanced users to expand and explore the contents of a saved file and thereby edit individual custom panels in an XML editor, and update images offline, etc. The same utility recompresses the file for opening again in System Architect. Working closely with the user-base of tour sound and contracting professionals, SDIG engineers have carefully enhanced the Custom Control Panel design experience. This includes a more automated mechanism of creating controls on a panel and assigning them to system-wide parameters. By dragging any device parameter from the System Explorer tree or Advanced Parameter Search utility and dragging onto a Custom Control Panel in the design environment, the user will be prompted with a concise list of only the appropriate controls to which it can be assigned. In user tests this mechanism has proved a significant impact on the time taken to create Custom Control Panels. The same mechanism has been implemented for enhancing Custom Control Panel navigation panel: shortcut controls can instantly be placed on a Custom Control Panel simply by dragging the appropriate panel icon from the panel toolbox. Other Custom Control Panel additions include a freshly-designed Parameter Address Editor dialog, which primarily provides a mechanism for editing parameter assignments of pre-existing controls, but the layout of which is also perfectly suited to enabling fresh parameter assignments. SDIG has also added the ability to copy and paste just the visual elements of a control without copying any parameter assignment. Together these enhancements serve to speed up not just the functional design process of a panel, but also the visual design element. Additional user interface enhancement includes new window management improvements, offering menus to cascade all open windows or select an active window from a list. Concentrating further on user experience and interaction, a Device Arrange Tool in the Venue View enables the reordering of a selection of devices by device name, device type, device address or device brand. DigiTech®, a leading manufacturer of guitar, bass, and vocal processors, and a Harman International company (NYSE-HAR), has announced its newest addition to its popular line of vocalist products: the VL3D Desktop Harmony Processor. The VL3D is specially designed for keyboard players requiring back-up harmonies for either live performance or studio recording. The VL3D offers 3-part harmonies using DigiTech’s exclusive MusIQ™ Technology, which analyzes the singer’s voice and adds the most musically correct harmonies while offering real-time pitch correction and gender control. Featuring single-level programmability and five user defined voicing patches, the VL3D can be programmed on the fly without missing a note. 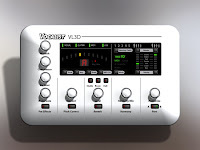 The VL3D’s inputs include Midi In, Out/Thru, guitar or line level, and XLR. Speaking about the new VL3D, Scott Grow marketing manager for DigiTech stated, “The VL3D represents the latest in vocal harmony technology, and our commitment to giving musicians the most advanced processing and best sounding effects in the industry”. The most advanced pedal in the series, the RP1000 features 200 presets, external amplifier loop, external stompbox loop switches, external stompboxes, and effects in and out of the effect chain. The amp/cabinet bypass feature defeats the unit’s internal amplifiers and cabinet effects leaving only stompboxes and gear inside the amp and stompbox loop. It has an MSRP of $699.95.